This cute little doll hat is perfect for accessorizing outfits. It has been crocheted from dark purple yarn and I've added a bright pink heart button for fun. It's always fun to have a new hat. Need a bunch? I'm always happy to make a special order for you and I do give discounts for purchasing multiples. They are great for a birthday party! Ordering more than 3? Contact me for a discounted price and to save on shipping. 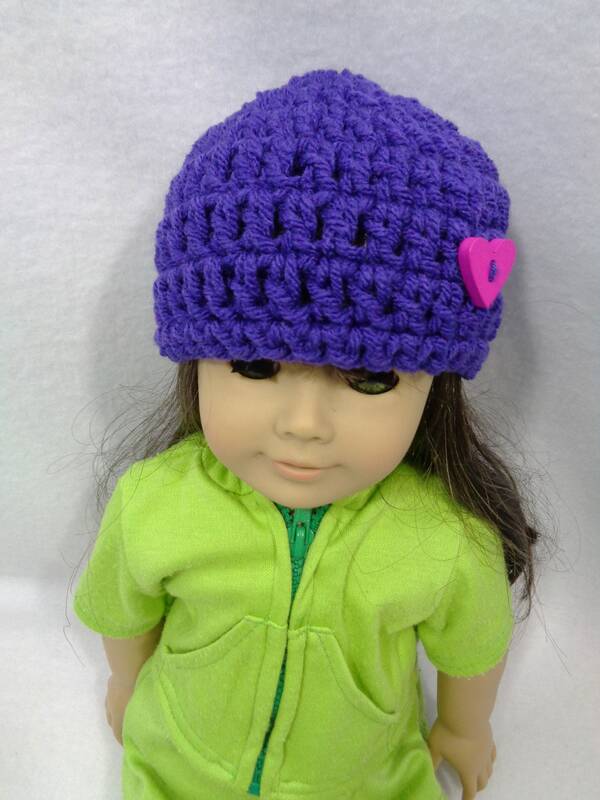 Want a matching hat for your little girl and her doll. Just let me know and I'll be happy to make them a set! Please note the color is a dark purple, but may appear differently on your computer monitor. These little hats can be machine washed and dried. Please take a look at my other toys, baby hats and many other great items in my shop.